As mentioned on this blog yesterday, this week’s Marine Corps Times cover story focuses on Lance Cpl. 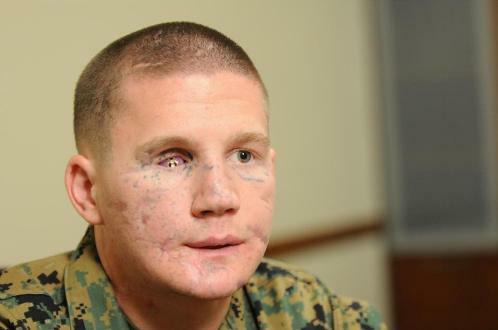 Kyle Carpenter, the Marine infantryman who has achieved a miraculous recovery after sustaining a grenade blast near Marjah, Afghanistan, in November 2010. Marine Corps Times has taken some heat for reporting that there are questions over whether Carpenter covered the grenade to protect his buddy, Lance Cpl. Nick Eufrazio. Actions along those lines have yielded prestigious valor awards in the past, obviously. Those questions exist, though, at least in the minds of some in the Corps. Additional Marine sources have reaffirmed that since the story was published yesterday. Both lance corporals are heroes nevertheless, but Marine officials acknowledge they are uncertain what happened and still investigating. That doesn’t take away from Carpenter’s sacrifice, though — or the inspiring way he carries himself now. I sat down with him at the Walter Reed National Military Medical Center for the story, and was blown away by his optimism and grace. When you see this video, I think you will be, too. We’ll have another story about this incident in next week’s paper featuring comments from other Marines who were in the compound when the grenade exploded. This story isn’t going away anytime soon. My heart goes out to men who give so much to serve Bless You to all wounded Marines and everyone else. we’re not inside your circle so if these issues exist it would be nice if you stopped playing inside baseball and spell it out. There are many of us Marines that have served in the Corps as Grunts and never seen combat. It is explained to us that, “It just wasn’t in the cards” or, “It wasn’t your time”. Many of us don’t agree with that logic. We sometimes go through life feeling cheated because of that. Then, we see the results of what happens to our younger Marine brothers and sisters and at times feel helpless that we were not their to take their places. Helpless because these wars should have been fought in our time so that the next generation didn’t have to experience what they are involved in now. I can always lend my years of experiences and looking back, lend the best advice and solutions that I have dealt with in trying to become a citizen after the Corps. We fool ourselves, us inactive Marines. we will never return to the status of civilians. Our boots will never again touch civilian turf as we are Marines until we die. At least allow us to offer to aid and assist any of our fellow Marine brothers and sisters in their transitions back into society. One way or another, there are many ways to aid and assist if you would allow us that privledge. There is much we older Marines can do for you through our experiences with being on this side of active duty. Advice and warnings for any of the many pitfalls that you may wonder onto. The offering of solutions to whatever problems or issues you may face. Anything we can do to make your way of life easier to deal with. At least allow us that much. Solomon, thanks for the comment. The previous blog entry that I linked above spells it out. The true hero’s of America are these brave men and women who serve our country! All I know to say to them are Thank you and I am forever in your debt. I met this man today. He is a real hero and inspiring. Not only that, but he is still fighting for what he believes in. Through the rest of my military career I will recall warriors like him when I’m having a rough day, so I can remember why I chose this path. meal. And it’s this negative association with dieting calendar which can often make it such a bad choice for losing weight. The Lap-Band does not tell you what to do and feel good with the results. Or perhaps you want to see results right away. The best way to get dieting calendar the body of free radicals.